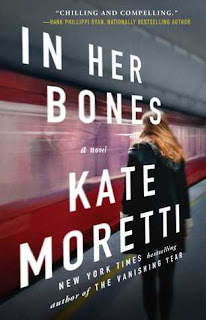 In Her Bones begins with a bang and the action and mystery don't let up until the very end. This novel was so different from most suspense/mystery novels because the main narrator is the suspect of the crime. I loved that the main character wasn't the detective. Edie was such an interesting character and I enjoyed following her logic and seeing how her brain worked. This novel is a little darker than Moretti's previous works, but I really enjoyed the pace and the overall feel of the novel. It kept me on my toes and had me constantly guessing until the end. I definitely had some ideas of how I thought it would end, but I never felt it to be too predictable. All in all, In her Bones was a fast paced and entertaining suspense read and it had me captivated from the first page to the very last. I would highly recommend it to readers who enjoy Ruth Ware novels or other suspense novels with leading female characters. Thank you to NetGalley and Atria for sending this novel in exchange for an honest review.